The Group’s total revenue (excluding North America) increased by approximately 10%, which was due to an increase in sales volume of approximately 3.1% and an increase in average selling price for the year ended 30 September 2018. 6.9%. The European market is the Group’s largest revenue market and accounts for approximately 40% of the Group’s revenue. The market continued to perform well and benefited from the significant appreciation of the euro against the Hong Kong dollar during the period. As a result, the revenue of the European market in Hong Kong during the period soared by more than 11% and is expected to contribute significantly to the Group’s profitability as the Group’s operating margin in the European region is relatively high. Due to our sales and marketing efforts in the fierce market competition, the Greater China market continued to record a revenue growth of over 10% in Hong Kong dollars during the period. Despite the depreciation of the Australian dollar, the Australian and New Zealand markets recorded sales growth of approximately 5%, mainly due to the increase in orders for Chinese products and the rising demand from dental companies. (ii) The management plans to focus on the higher price and profitable products of the MicroDental Group and gradually phase out the price and lower profit products. Simply put, except for North America (70% of total revenue), 9-month revenues grew 10%; North America (30% of total revenue) fell less than 2%. A little calculation, the data as of the end of June shows that North America’s income is reduced by 2%, which is almost the same as the 9-month data, but the income in the first half of North America is 15%, and the 9-month data is income. A 10% increase is a significant slowdown in revenue growth in July-September. [Announcement Summary] Modern Dental (03600.HK) increased revenue by 10% in the first three quarters except North America. If you don’t look at it carefully, you don’t know that the income in North America has fallen by 2%. In addition, the nine-month data disclosure in the past two years includes the total number of sales and the average selling price. The total revenue can be calculated by simple calculation. However, this year only disclosed the number of sales and the average selling price outside North America, but there is no North American. 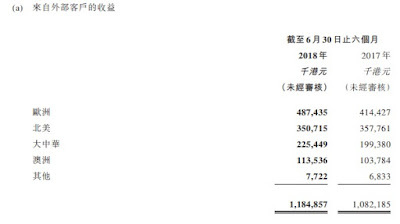 The details, so it is impossible to calculate the total income, but can simply summarize the sales growth as of the end of September has slowed down, overall the growth is definitely lower than the 9.5% growth in the first half. The management played a small trick on the disclosure and used a good presentation skill. I didn’t take the risk and chose to lose 1.5%. This entry was posted in Investment on 3 December, 2018 by Wai Gor.